We have a demo for a good price. A legendary name in motorcycling, the original Triumph Speed Twin was quite rightly renowned worldwide as a motorbike that set a new benchmark for thrilling power and sublime handling. In keeping with this incredible heritage, today’s all-new 1200cc Speed Twin delivers a step change all over again with class-leading handling and performance supported by advanced rider technology in a beautifully modern custom style. This is a brand new performance icon that introduces a next generation of dynamic capability; a modern classic custom roadster, with a totally intuitive and accessible feel, advanced technology, exhilarating torque delivery and a distinctive British twin sound. 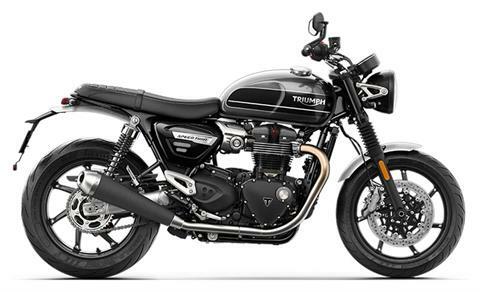 The new Speed Twin blends Triumph’s timeless DNA with cutting edge Thruxton-tuned performance, together with elegant finishes and detailing, and modern classic stripped-back custom style and poise. PREMIUM ALUMINIUM DETAILS: Category-leading finishes and detailing include premium brushed aluminum front and rear mudguards, throttle body covers, side panel finishers and heel guards, bright anodized forged aluminum headlight brackets, and a clear anodized aluminum swingarm. THREE RIDING MODES: Three selectable riding mode options – Road, Rain and Sport – control dedicated throttle maps and traction control settings to suit riding conditions and rider preferences for an optimum riding experience. TWIN UPSWEPT SPORTS SILENCERS: Contemporary black megaphone twin upswept sports silencers contribute to the thrilling deep British roar that lives up to the Speed Twin’s legendary name. Triumph’s innovative uninterrupted flowing exhaust header run contains a hidden cat box. LED LIGHTING: For greater durability and power efficiency, the Speed Twin incorporates LED rear light and indicators. Where local legislation allows, an LED Daytime Running light is incorporated into the headlight. FEATURE-PACKED TWIN CLOCKS: Super-stylish contemporary 3D dial faces incorporate a digital menu system accessed by handlebar mounted scroll button. Key features include; rider mode setting, gear position, odometer, trip settings, range to empty, clock, and fuel level. HIGH SPEC WHEELS AND TIRES: New lightweight 7-spoke 17-inch cast aluminum wheels and Pirelli Rosso Corsa 3 tires all significantly contribute to the Speed Twin’s dynamic roadster handling. MONZA FUEL CAP: Flip up and fill quickly; a stylish touch that’s in keeping with the Speed Twin’s contemporary custom looks. BAR END MIRRORS: Ensure excellent wide-view rear visibility during your ride with these great looking bar end mirrors. ACCESSIBLE LOW SEAT HEIGHT: The Speed Twin’s new bench seat has an accessible seat height of 805mm and has been developed for enhanced rider and pillion comfort. OVER 80 CUSTOM ACCESSORIES: Enhance the style, comfort and capability of your Speed Twin with a choice of over 80 ride-focused accessories to reflect your own personal riding needs. Front - Cast aluminum alloy, 17 x 3.5 in. Rear - Cast aluminum alloy, 17 x 5.0 in.